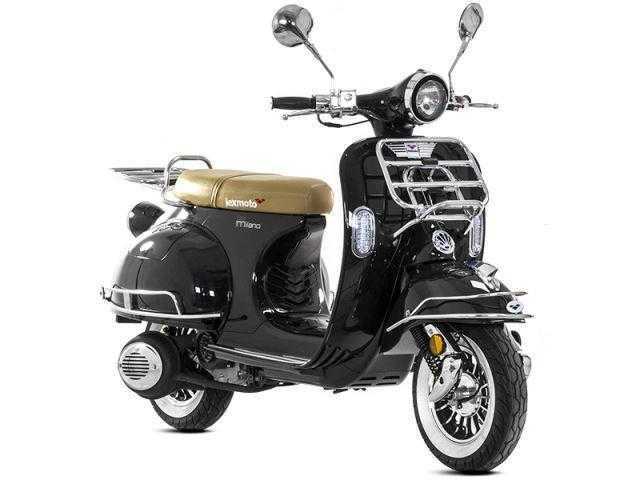 MILANO 50, Available in Black, White or Blue, £1375 â€œOn The Roadâ€ inc Road Tax,etc. Please contact us for a full personal quote. Sometimes riding a scooter is about more than just a method of transport. It`s not just a vehicle it`s an expression. The Lexmoto Milano offers classic styling together with a reliable 4 stroke 125cc motor. The Milano uses Super bright LED indicators to ensure that other road users are not only admiring the bike but are aware of where you are heading. The classic styling is presented in a choice of 3 sophisticated colour options with a Tan coloured seat to encapsulate that 60`s Mod!